I am glad to inform you that i have received the car i purchased from your company yesterday after paying required taxes. The car is in a very good condition and i wish i could know the previous owner so that i can thank her/him. Me and the whole family are very happy. I wish to take this opportunity to Thank your company for job well Done, I have got my car( Mark II) in good conditions and hope for more and better business in future. Yuki! [...] Many thanks to your company for the honesty in doing business.My car arrived in good and exact form as ordered. You are WORTHY a Trust company.Find attached pictures of the car. My regards and May God bless you. Hello, I hope you're ok!!! This is to let you know that I received the car and today is my second day driving it!!!! So far so good!! Hi Dear Ali, Thank you for your good service. I want to tell you that on 20.05.2010 I got my car from the port of Poti. Now our family is very Happy! I want to say "thank you" again. Thanks for your usual support. My hope that this email finds you are ok. Greetings from Dar es Salaam. I have seen the vehicle, it is in a good condition despite some small unseen scratches seem like during shipment but the car is in best condition. That’s a lot for keeping your promises. Looking forward to do business with you again my dear. Hi, This is to let you know that the vehicle reached Nairobi in good order. Looking forward to doing further business with your company. Thank you for your valued support i am now driving the Mazda MPV and it is driving well.I really appreciate. Goodmorning. I wish to thank you for the good service that was provided to me. I received the Nadia yesterday. I'm a very satisfied customer. Thank you and will surely recommend your company to a friend. Hope you are fine. I write to thank you for your professionalism and forkeeping the name of your company "TRUST". My family and I are now proud owners of a Toyota Lucida. Best regards and may God protect you. I am pleased to inform you that I received my vehicle in an as good condition as you portrayed in your photos and description. I look forward to do more business with your company. God bless you all at Trust. [...] the car is doing very well. It is climbing the mountains of Lesotho and it is now 4years old. It is rare that one can still follow up the health of their product so I am giving you this rare pleasure. Please refer to the attached. Greetings from Uganda. I am glad to inform you that I received the Toyota Premio in good shape. It arrived at Mombasa Port on 17 May 2010. I take this opportunity to thank you very much for all your input which enabled me to buy the car. The car is very beautiful and in a very good sound condition. I am goig to refer my friends to your company so that they too can get good cars like mine. I also thank Trust company for the trust and honesty. May God bless and keep you. We are glad to let you know that we have received Lucida and is at home. We thank you very much for the patience and support. That was very professional. Lucida looks Fantastic and is in very good condition even after travelling in the ocean and covering more than 1500km on the road to get up to here. Lucida is elegant and very powerful. 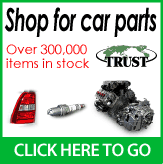 We hope other friends all over everywhere will opt for Trust Company for their vehicle needs including spares. About Sales persons, Maki Hyodo you are a great person at Trust Company. [...] I inform you again that I received my car on 25th May 2010. (MAZDA DEMIO).Greet all your team staff. Thank you for your good service, This message serve to inform you that today I got my car from the port of Tarawa. Now me and my family we are very Happy and thank you again. Hi Y. Takeichi, This is really great. Your services are fantastic so keep it up. Hai, I wish to inform you that i have received the car and its in very good condition.